Today we launched a new section on our Better Health Innovations site with deeply discounted items that are in virtually perfect condition, but that we can not sell as new. Looking for a deal on an inversion table, rowing machine, or dumbbell set? 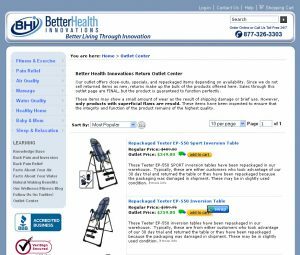 These are just a few of the items now available on the Better Health Innovations Outlet Store. It is time for spring cleaning, and we need to move repackaged, returned, and used merchandise. Note that only products with superficial flaws are sold in our outlet store. They all function just fine and we guarantee that they are in working condition. In fact, most of the items come with the full factory warranty!